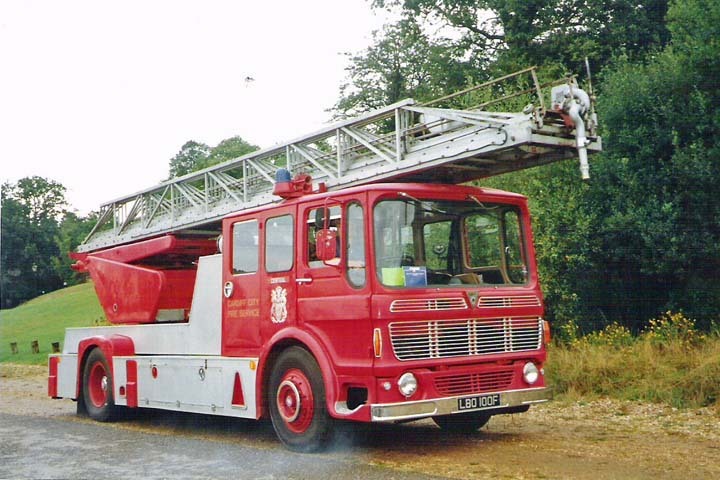 Supplied new to the Cardiff City Fire Service but then was transferred to the South Glamorgan County Fire Service on amalgamation in 1974 was this 1968 AEC Mercury/Merryweather TLP (100ft turntable ladder with pump).This appliance remained in service until 1985 and then was presented to the South Glamorgan Fire and Rescue Service Historical Vehicle Society.This photograph was taken in 1994 at the Solent Emergency Vehicle Show.In 1992 Corgi Toys used this very appliance as a base for a limited edition die cast model,which still today is released from time to time with different fire brigade loco's on it.Certainly,one of the classics from the 1960's,and a classic Corgi Diecast Model. this fire engine was given to me as it is in need of a full strip down and rebuild. i still keep it with mid & westwales fire brigade preservation group. and it will take me about 2 years to bring it back to its former glory.as i have a land rover to do first. Added by IAN JAMES on 09 August 2008. Hi Ian, its good to know this Aec/Merryweather's still around. Best of luck in the restoration, when you can get around to it. Added by Pete Matten on 10 August 2008. Added by Patrick McAlevey on 02 September 2008. Patrick, maybe you can send us a picture in whilst the appliance was on the run in Cardiff back in the 70's or 80's.Pete. Added by Pete Matten on 03 September 2008. This vehicle has not been given to anyone, it is the property of Mid and West Wales Fire Engine Preservation Group. Maybe Ian James has misunderstood this fact in the article above, after he did some maintenance work for a former member of the Preservation Group. I am the Groups Transport and Fleet adviser and I am available as per details below. Added by David Schuneman. on 08 December 2008. Excuse me, Mr Ian James, but who 'GAVE' this ex Cardiff City TL to you? Added by Ms Tucker on 08 December 2008. Good luck with this project, hope to see it around the rallies again pretty soon. Added by Malcolm on 04 November 2009. Pete, see photo of this machine at Ely Fire Station, Cardiff. picture #33398. Taken in 60's. Added by Tony (Taff) Madsen Fm 1565 on 19 November 2012. I worked at Merryweathers as an apprentice engineer from 1964 to 1969 and would have workedcon this fire engine in the fitting shop. My father did his apprenticeship at Merryweathers in thec1940s. Added by Jim Dixey on 26 March 2015. Update, - Now sadly rotting away after being parked up at the old ALCOA factory site in Swansea for years. Some preservation! Added by Patrick McAlevey on 22 March 2017. 'OH', what a bloody shame, this was a lovely looking appliance when I last saw it and took this picture way back then. Added by Peter Matten on 23 March 2017. Maybe they should have gave it to Mr ian james, he may have finished it, yip some preservation indeed but to be fair we don't know the specifics but it would have been great to see it back on the road no matter who did it. Added by Alan Ramsay on 24 March 2017.